The exhibit hall at General Assembly is a lively place with hundreds of exhibitors including PC(USA) agencies, General Assembly organizations and projects, seminaries, non-profit organizations, a book store, and the Global Marketplace that sells partners’ fair-trade items. The Presbyterians for Earth Care booth was an active place to learn about caring for God’s creation with several activities related to reducing and eliminating single use plastics and the impacts they have on marine life when they get into our oceans. Mark Eakin, PhD, gave a talk at the PEC booth about the impacts of climate change on coral reefs and the people who depend on them, and the negative effects of plastic pollution. Mark is Coordinator of NOAA Coral Reef Watch and scientific advisor to the Sundance winning film, Chasing Coral, on Netflix. We decorated our booth with disposable plastic containers attached to a cord and hung in the corners of the booth. We also displayed photos of marine animals and the enormous amounts of plastic trash they must sort through to find their food. The topic was so popular that we are sharing the following resources for you and your friends. • The Last Plastic Straw campaign encourages restaurants to serve straws only upon request. We handed out small cards to give to servers who provide straws without asking. Download a sheet of cards to print and cut. • Reading facts about plastic pollution can be alarming but also inspiring. • Use the plastic consumption calculator to determine how much plastic you use and make a plan to reduce it. 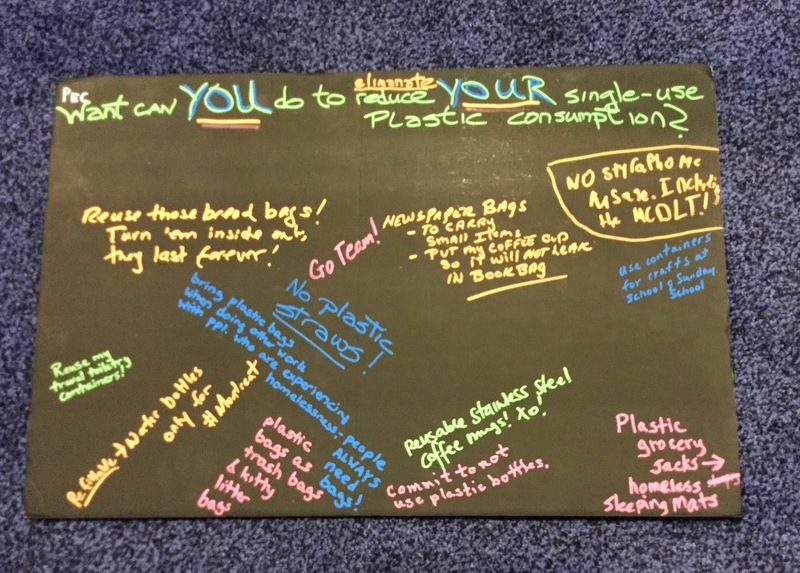 We asked visitors to write down what they could do to reduce or eliminate their single-use plastic consumption and got some useful answers: use shampoo bars and reuse travel toiletry containers, use paper wraps for sandwiches, switch to canvas bags and mesh produce bags, use refillable water bottles and reusable coffee mugs. Visitors could also enter the PEC daily drawing to win a PEC t-shirt or a book by joining or renewing their PEC membership. 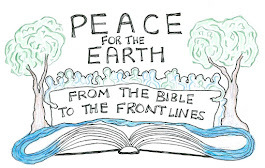 We encouraged all to sign up to be on the PEC e-mail list and to consider buying and wearing a PEC t-shirt to help promote Presbyterians for Earth Care. PEC is a non-profit organization, separate from Environmental Ministries, but with similar goals to provide a faith-based collective voice seeking environmental wholeness with social justice. More resources about plastic pollution can be found in the Earth Day Network Plastic Pollution Primer and Action Toolkit.